At Allenton Tool & Machine, we are the premier source for the design and repair of low pressure for the permanent mold aluminum casting industry. The model shown here is for an electrical transformer component used by the electrical utility industry. Tool steel was chosen for its repair and/or change flexibility and its long durability over the casting process life cycle. The mold was manufactured on our larger capacity vertical machining center needed to handle the mold size as designed for successfully pouring into the mold 70 pounds of molten aluminum used in the casting process. 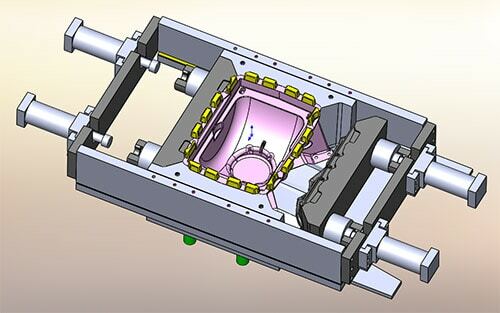 This project highlights not only our precision tooling machining capability, but our extensive experience working with complex casting modeling and tooling software. We go back and forth with our customer engineering people to produce a model that all parties (their customer product engineers and our customer process personnel) are satisfied with before steel is cut. As a result of the speed and quality of the tool produced for this project the customer has contracted with us to manufacture several more molds. In addition, our Allenton plant performs extensive mold repairs over the life of molds that last years and years. We also design and manufacture specialty fixtures used in the casting and machining process to produce the finished end part. We have made numerous fixtures including leak test, saw cutting, machining and robotic equipment. For additional information about this custom casting mold project, see the table below, or contact us directly.